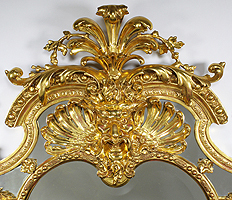 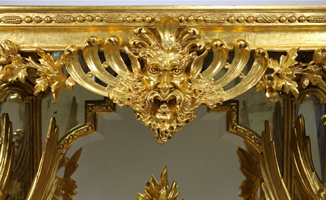 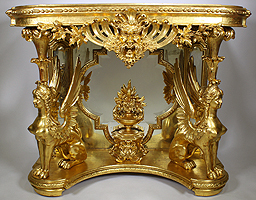 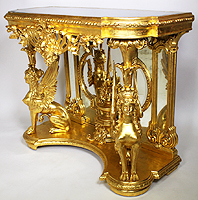 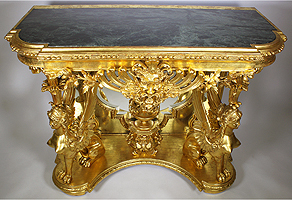 A Fine French Empire Revival 19th Century Gilt Wood and Gesso Carved Figural Console Table with Matching Mirror. 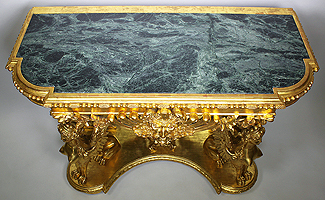 The "D" shaped top console raised by a pair of seated winged sphinxes with notched corner frame over a conforming frieze, centered by a pierced carved Satyr mask with foliate swags, above a mirrored trefoil backboard centered by a flowering urn adorned by chimera, raised on a shaped base and fitted with a Verde d'alps marble top. 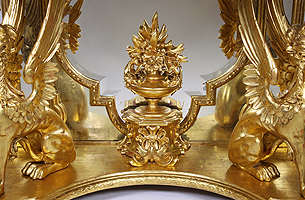 The figural mirror flanked by a pair of seated winged sphinxes, with carved scrolls, garlands and crowned with a pierced carved Satyr mask with foliate swags and acanthus, flanked by a pair of floral urns. 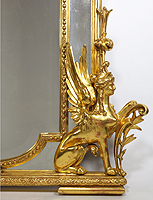 Circa: Paris, 1880-1890.